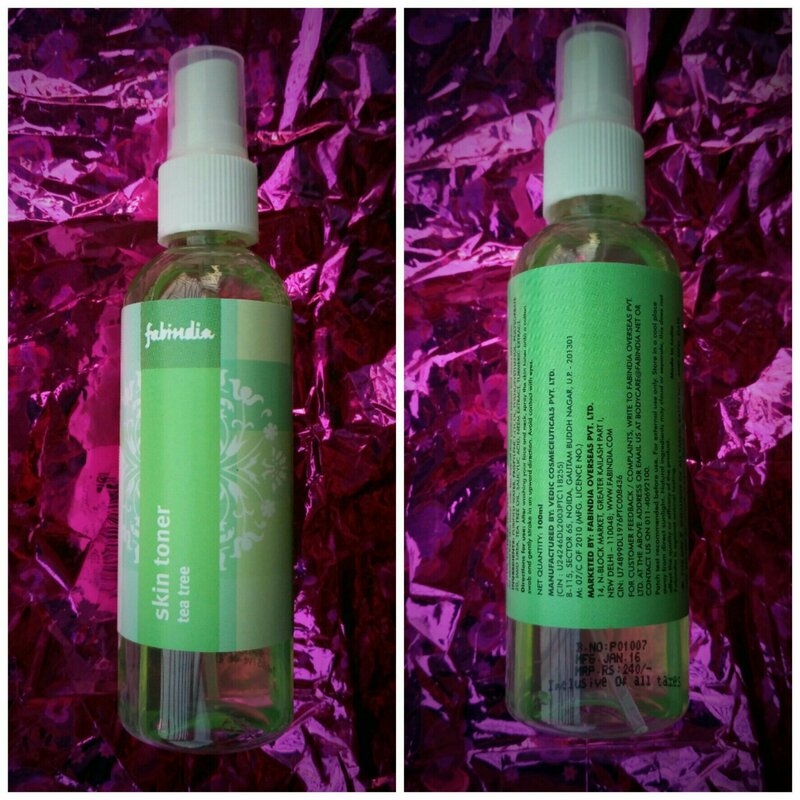 An alcohol free skin toner with Tea Tree oil that controls sebum and clears blemishes. Purified water, propylene glycol, phenoxyethanol, polysorbate 20, imid urea, tea tree oil, salicylic acid, neem extract , turmeric extract. DIRECTIONS: After washing your face and neck ,spray the skin toner onto a cotton swab and gently stroke in an upward direction. Avoid contract with eyes. CAUTION: Patch test recommended before use. For external use only. Store in a cool place away from direct sunlight. Natural ingredients may cloud or separate, this doesn’t affect the quality or efficacy of the product. So, basically I chose this toner just to help me from acne and sebum ( I have a combination skin which turns really oily during Summers 🙁 )… Let us see if it did its job well! Every day after shower, I take two sprays of this beautiful light green liquid on a cotton swab (Though the colour doesn’t show up on the swab! 😀 ) and gently apply on to my face..
Now, talking about its claims! The pack says it controls acne and sebum! 1. Affordable and will last you for ages! You can buy it from here! 2. A low to average toner. May work a bit better for dry skinned beauties. 3. Can be used to bind dry ingredients together in a DIY face pack! 1. Doesn’t control acne; Doesn’t control sebum; Does nothing that it claims. Very honest review. Your review help me a lot to decide whether i purchase it or not. Thanks dear. Thank you so much for sharing this amazing bit, One of my friend was thinking to buy this product, will definitely share this link with her. Thank you for visiting dear… I am glad I could help you! 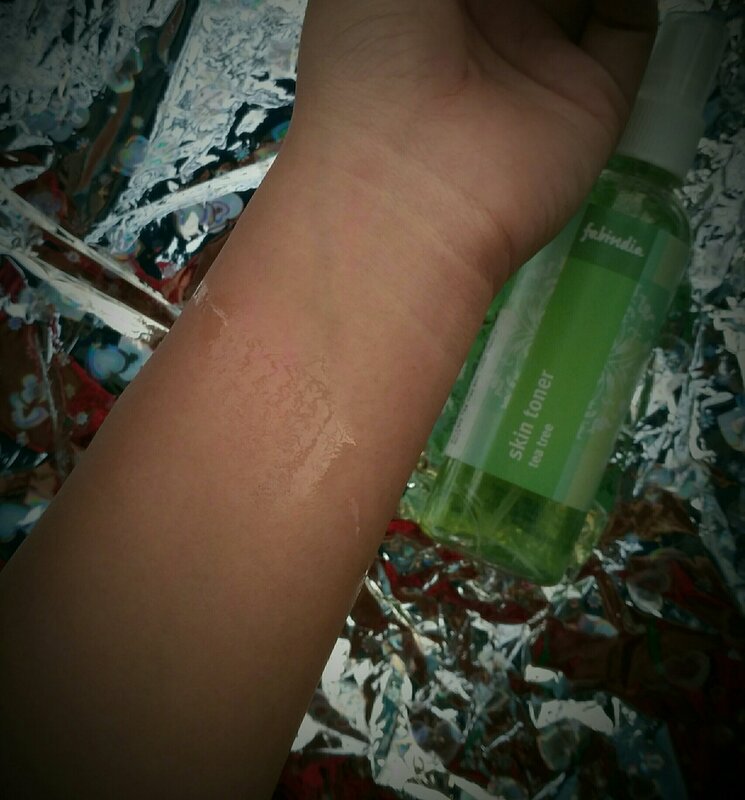 I was quite a loyal to this toner few years back but it didn’t show any effect on my acne. Glad I switched. Love your honest review on the product. I have never heard a lot of good words about Fabindia skincare although I want to try their toners. Thanks for sharing your experience with us! Appreciate the frank and honest review. Though the product does not seem to harm in any way. It still does not seem to have any effect on acne, which is important. Sad to know that it doesn’t controls acne and the claims it makes. My skin is normal, so I think I can just use it to bind dry items for my mask at times. Yes, you can definitely use it that way! Oh no! That sounds terrible. I will definitely avoid this product now that I have read your honest feedback. Thank you for the trust dear! Tea tree is amazing for skin and is super effective. But I haven’t heard much good about fabindia products. I’m skipping this toner. Never used any Fab India products and after reading your experience I possibly never will. Thanks for this review. I once took a Fab India Lip Balm. It was a waste of money too. The best one I have used till now is by Joy. From then on I have never used any other brand for lip balms, Body Moisturizer etc.